Powered by Fluensulfone, NIMITZ Pro G is a novel nematicide developed globally by ADAMA and Control Solutions for the Quali-Pro brand. It is the first new chemical nematicide to be developed in more than 20 years. Turfgrass professionals now have a new tool for managing nematode populations affecting turfgrass. The fast acting and unique mode of action effects make NIMITZ Pro G a key tool in plant parasitic nematode management strategies, while residual activity continues to control nematodes and increase overall plant health. Fluensulfone is systemic, reaching both endo- and ecto-parasitic nematodes inside plant roots and in the surrounding soil. NIMITZ Pro G causes irreversible nematicidal activity lethal to all nematode stages within 48 hours of exposure, all while not disrupting the delicate soil ecosystem balance. NIMITZ Pro G represents a new level in nematode control including greater application flexibility, a CAUTION signal word and unique mode of action effects on all life stages of nematodes, including the eggs. 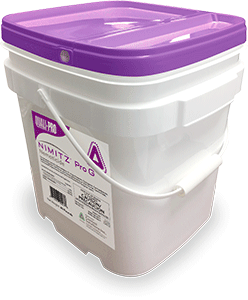 No other synthetic nematicide available can offer the environmental benefits and efficacy that NIMITZ Pro G can.